After nearly a year in Balad, soldiers arrive to cheers and hugs. CHRIS DETRICK | The Salt Lake Tribune Staff Sgt. 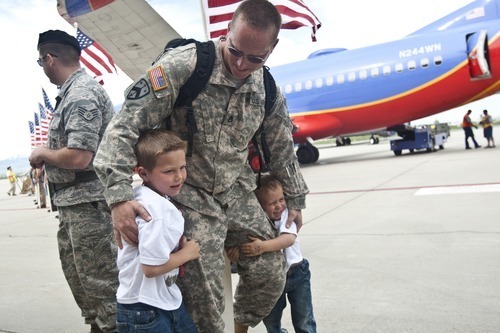 Kevin Lowe hugs his sons Hunter, 6, and Tracer, 4, as he arrives at the Utah Air National Guard Base Saturday morning. About 100 Soldiers of the Utah National Guard's Group Support Company, 19th Special Forces Group (Airborne), returned to Utah from their 12-month deployment to Iraq. CHRIS DETRICK | The Salt Lake Tribune Jessica Tingey kisses her husband, Sgt. Kendall Tingey, as he arrives at the Utah Air National Guard Base Saturday. Tingey was among about 100 soldiers of the Utah National Guard's Group Support Company, 19th Special Forces Group (Airborne), returned to Utah from their 12-month deployment to Iraq. CHRIS DETRICK | The Salt Lake Tribune Members of the 19th Special Forces Group arrive at the Utah Air National Guard Base Saturday. About 100 Soldiers of the Utah National Guard's Group Support Company, 19th Special Forces Group (Airborne), returned to Utah from their 12-month deployment to Iraq. CHRIS DETRICK | The Salt Lake Tribune Katrina Rose Anderson, right, holds a sign for her brother Darrell Allen Anderson as he arrives at the Utah Air National Guard Base Saturday morning. 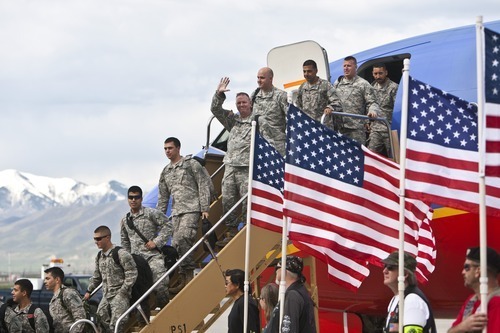 About 100 Soldiers of the Utah National Guard's Group Support Company, 19th Special Forces Group (Airborne), returned to Utah from their 12-month deployment to Iraq. CHRIS DETRICK | The Salt Lake Tribune Jessica Tingey jumps into the arms of her husband, Sgt. Kendall Tingey, as he arrives at the Utah Air National Guard Base Saturday. About 100 Soldiers of the Utah National Guard's Group Support Company, 19th Special Forces Group (Airborne), returned to Utah from their 12-month deployment to Iraq. Heather Nehring knew if she picked pink, she would stand out. Other families awaiting the return of the Utah National Guard's Group Support Company, 19th Special Forces Group (Airborne) from Iraq were sure to choose red, white and blue, or even "support our troops" yellow for their signs, balloon bouquets and flags, but Nehring was sure no one else would pick the baby-girl shade of her balloon bouquet. "We're trying to embarrass my husband," she said, standing on the right side of the Salt Lake City Air National Guard hangar where she said goodbye to her husband 11 months ago. "This way he can spot us." Nehring's husband was among about 100 troops who returned home from Balad, Iraq, where they provided support services to other soldiers, ranging from fuel and food to paperwork and intelligence. The troops flew in to Salt Lake City via Camp Atterbury, Ind., where they spent the last few days demobilizing before coming home, said Guard spokesman Lt. Col. Hank McIntire. Skyler Gonzalez showed up in a mini uniform to welcome home his father, Spc. Benjamin Gonzalez. It will be only the second time father and son have seen each other, explained 5-month-old Skyler's mom, Cassie Gonzalez, since she gave birth during her husband's deployment. Spc. Gonzalez was able to visit the family for 10 days following his son's birth, but then had to return to active duty. "Doing everything alone was the toughest," Cassie Gonzalez said. "We have support from family, and that hel ped a lot." Gonzalez prepped Skyler for her husband's return by listening to recordings of his voice and video chatting over Skype. "I think he's ready," she said. A deafening cheer went up when the soldiers' charter plane arrived, augmented by a military band playing patriotic tunes. The soldiers disembarked and were quickly engulfed by cheering and hugs from their families. A civilian motorcycle group provided an honor guard for the troops. Sgt. 1st Class Daniel Nehring was quick to find the pink balloon bouquet, surprising his wife with a giant bar of her favorite candy and a teddy bear. "Her," he said, pointing at his wife when asked what he was most excited about coming home to. "We've been married 23 years, and we've been together 27, and still just as in love as we were then." Heather Nehring and her children had a few surprises of their own for the returning soldier. Neighborhood Boy Scouts planted American flags in every yard along their Taylorsville street, and tied yellow ribbons on every home and tree. Goodwood Barbecue is delivering lunch for the family as soon as they get home, and after spending some time relaxing, the couple will finally get some alone time at the Salt Lake City Marriott hotel Saturday night. "It's good to be home," Daniel Nehring said.